No, I’m not trying to trick you! 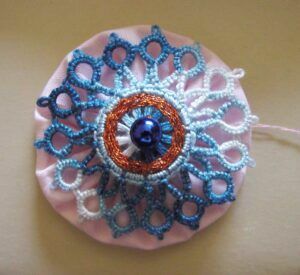 I couldn’t resist the shiny pretty sparkly photos on the online tatting class website so I bought some birch creative button forms when I went to Spotlight yesterday and I made one. Since I would never wear anything this outrageous I thought it would make a nice decoration for the top of the box when I wrap up the coverlet*. Oh, and that thing that it’s sewn to? A suffolk puff. You can’t get away from them around here lately! *Speaking of which, I had better get back to sewing it together.